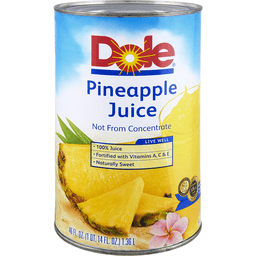 Premium organic pineapple juice from concentrate. Unsweetened. No preservatives and no artificial flavors. 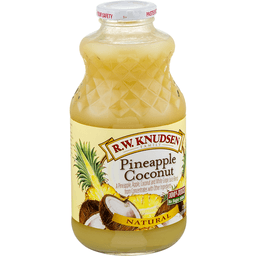 130 calories per 8 fl oz. USDA Organic. Certified organic by Quality Assurance International. Non GMO Project verified. nongmoproject.org. Made with the finest all-natural ingredients. Pasteurized for your safety. In 1961, a harvest of grapes from organic vineyards in Paradise, California, inspired R.W. 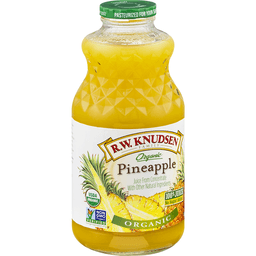 Knudsen to pioneer a new tradition of bottling fruit juices. His commitment began with a desire to make juices of the best possible quality for his own family. Today you and your family can enjoy the R.W. Knudsen Family products made with the same commitment. Savor the refreshing goodness. Crafted with integrity and care. For goodness sake! - The Knudsen Family. Each 8 fl oz cup of fruit (serving information based on USDAs myplate [www.choosemyplate.gov]) provides a 1 cup serving. Natural separation may occur. 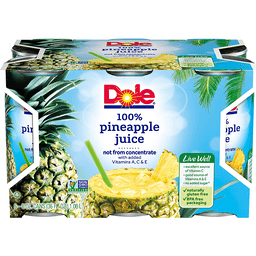 Contains 100% juice. RwKnudsenFamily.com. 888-569-6993. Glass recycles.